I am a firm believer in having a bag for everything. Maybe it is my incessant need for organization – or simply my love for adorable bags – but I honestly have more bags than anyone else I know. I always get excited when I see my friend and Independent Initials Inc Consultant Laura Blackburn sign up for gift guides because I get another adorable bag to add to my collection! We waited until the new catalog came out and boy was I glad! As the owner of about a zillion bags – this was one that was absolutely perfect for me… and I didn’t have anything like it! A beach necessity! A white, wipe clean interior provides the perfect place for a wet swimsuit or goggles after a dip in the ocean or to keep your favorite seaside reads safe and dry. Clear, front zipper pockets provides the ideal pocket for your cellphone to stay safe from sand and the best part: your touchscreen phone is still touchable through the clear, zipper pocket! Protection from water in front, clear pocket is not guaranteed. Wristlet strap attached with lobster claw attachment, perfect for a wristlet carry or to loop through and attaches to a tote or handbag strap. 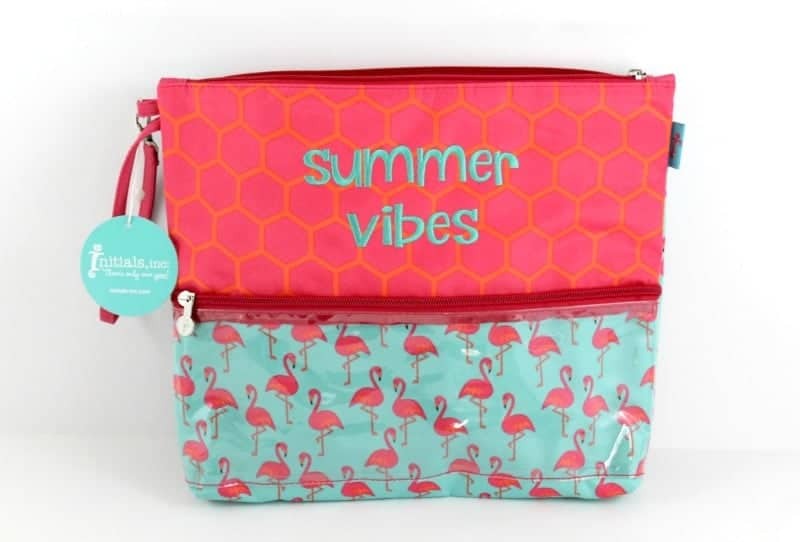 I absolutely love this bag – and it was no time at all before I had it loaded down with my sunscreen, sun glasses, and snacks to head off to the beach… all in the name of research of course! My great big iPhone 6+ fit just fine in the front of the bag – even with its case on! Immediately my girlfriends all wanted to know where they could get such a cute – and functional – summer must have bag! Initials, Inc offers adorable bags in styles and prints you can not find anywhere else! They also offer wallets and keychains and sun hats and more! As a Hostess you can earn exclusive products and discounts for sharing these awesome products with your friends. If you want even more, you can join Laura’s team and build a business your own way helping women get their lives organized – and look super cute doing it! Check out Laura’s website to learn more about what Initial’s Inc has to offer!